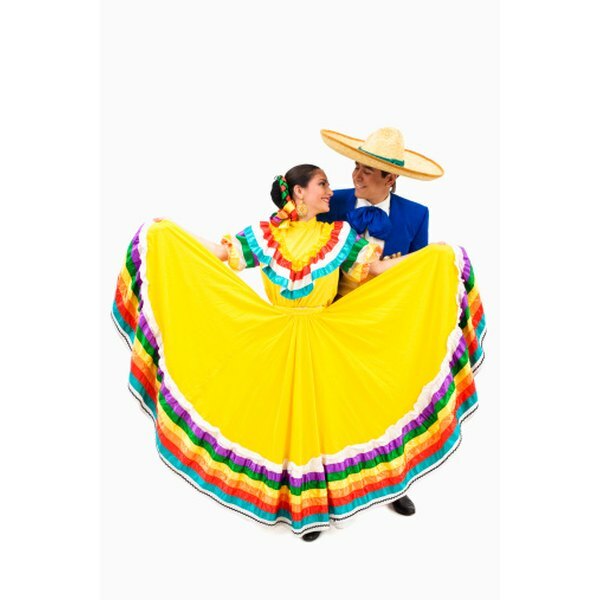 Mexican folklorico skirts traditionally use bright colors. The folklorico is a traditional Mexican skirt with many pleats, made for a traditional folklore dance. Fortunately for families preparing to celebrate, creating a beautiful folklorico skirt for a little girl is a simple sewing task. While constructing this skirt, it is important to keep an image of a traditional skirt in your mind. This image will guide you through the instructions and ensure you end up with a festive skirt fit for dancing! Select fabric for your festive skirt. Be sure to pick something fun in a bright color or pattern, and purchase the appropriate amount based on the height of the child. For children under four feet, you should not need more than a two-yard length of fabric. The width of the fabric bolt will correspond to the finished skirt's length, so make sure you choose a wide enough piece of cloth. Cut two to three strips of the entire length of the fabric, approximately 4 inches wide each. Cut the rest of the fabric in the shape of a very thick "rainbow." When inverted, the rainbow forms a circle skirt, with the rainbow's underside corresponding to the girl's waist. Make sure the piece is deep enough to give you the length of skirt you want. Join the two sides of the rainbow of fabric, right sides together, creating a funnel. Sew these two sides together to create the basic skirt. Add ruching. Use the cut pieces of fabric by sewing them along the bottom of the skirt in as many layers as you like, gathering the seam every few inches to create a ruffle. Finish the top of the skirt. To make a simple drawstring closure, make four 1-inch incisions at the waist . Turn the skirt inside out and wrap the drawstring or cord around the waist. Fold the top of the skirt over the cord, then sew the sections closed after first identifying the front of the skirt and ensuring the drawstring ends will come out the front. Clip the drawstring ends so that only 4 to 5 inches of cord stick out from the skirt. Hem the skirt. Fold under the raw bottom edge of the skirt and sew it all the way around, creating the hem. When sewing a seam, turn the entire piece inside out to sew. This will ensure that when you turn it back out, the seam will be even and invisible from the outside. Exercise caution when using scissors and needles; keep them away from small children. "Mexico: The Other Melting Pot": McFeaters, Bea. www.HoustonCulture.org.